A mini-tournament held the next day also saw ex-national and S-League footballers expressing their surprise at the pitch’s condition, which was patchy at best. This despite the 55,000-seater National Stadium boasting a state-of-the-art Desso GrassMaster system, a combination of synthetic fibres woven into natural grass to make it more durable. Costing an estimated €500,000 (S$833,000), the hybrid turf is also used in London’s Wembley and Emirates stadiums. The National Stadium’s first event late June — the Rugby World Club 10s — saw teams kicking up sand clouds, though many had expected the grass to be in tip-top shape for the Juventus visit over a month later. LionsXII assistant coach Nazri Nasir — who captained the national team from 1997 to 2003 — got his first taste of action on the grass at Sunday’s mini-tournament, and he told TODAY: “I was surprised that the pitch was not ready yet. It was very soft, very sandy and uneven. Maybe the artificial grass needs time to set in and hopefully, it will be better in one or two months. Local football fans who caught the Juventus vs Singapore Selection “live” in the stadium and on television were equally appalled. TODAY reader Mohamad Farid Harunal Rashid said he came away disappointed from his experience at the Sports Hub. 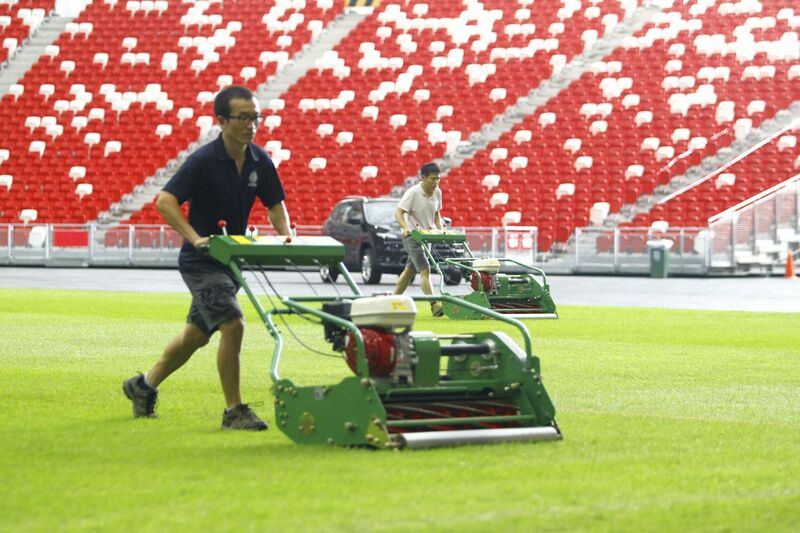 There are doubts now as to whether the pitch will be in top shape for November’s 2014 AFF Suzuki Cup, with Singapore hosting Group B here from Nov 23 to 29. Before that, an international football friendly between Brazil and Japan is scheduled for Oct 14, followed by the Mariah Carey and Jay Chou concerts on Oct 24 and Nov 8, and a rugby match between the Asia Pacific Dragons and Maori All Blacks on Nov 15.